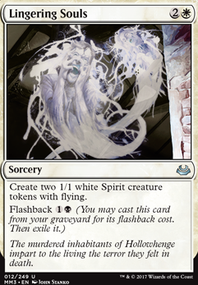 B/W Tokens is Saved! Thank you, Fatal Push! B/W Tokens control list Post Aether Revolt. Remove threats and put out tokens and beat face. Finally got to play the updated version of this deck at an FNM. We had 10 people sign up for a 4 round night. Round 3 I played a guy running B/W/R control with lots of targeted removal and things like Lingering Souls , Dark Confidant , and Abbot of Keral Keep , and Liliana of the Veil . He had too much single creature removal and I had enough to keep his threats off the board and out-valued him both games, dodging his sided in board wipes in game 2. Best part of this match was when he played Inquisition of Kozilek on my 3 card hand that was 1 Spectral Procession and 2 Gideon, Ally of Zendikar . It was fun and exciting to play this deck after a long time and even better to see it do well. The Fatal Push s definitely are a big part of the ability for success with this deck. It was nice as well that all of the opponents I played were solid veteran players, as I sometimes come up against new players with sub-par decks and the wins don't feel quite as earned. Excited to play it again. Im Gonna Sing the Doom Song Now! B/W 13;Tokens 13;is 13;Saved! 13; 13;Thank 13;you, 13;Fatal 13;Push!